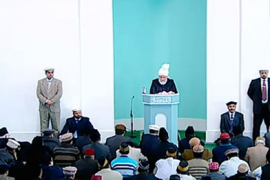 Friday Sermon Delivered by Ḥaḍrat Mirza Masroor Ahmad, Khalīfatul-Masīḥ V, May Allah be his helper, on 17 June 2016 at Baitul-Futūḥ Mosque, London, England. By placing this verse among the directive of fasting and its requirements and the verses about the directives about it, Allah has diverted our attention to the special relationship between Ramaḍān and the acceptance of prayers. Ḥaḍrat Khalīfatul-Masīḥ I, may Allah be pleased with him, explained this relationship in the following way. As the Fast is the means to learn righteousness, in the same way it is the means to attain nearness to Allah. The Holy Prophet (may peace and blessings of Allah be upon him) said that Satan is restrained in this month and Allah descends closer to the lower heaven. But comes closer to who? Those who feel or want to feel the nearness of Allah, and accept Allah’s directives to attain this end. They try to act upon the directive of Allah, “So they should hearken to Me.” They seek out the directives of Allah and come forward to act upon them. They have faith and belief that Allah has all power. If I will pray to Him while acting upon his directives and being sincere to Him, he will listen to my prayer. Though Allah says in response to the call by his servants, “I am near, I listen to the prayers of my servant, and especially during this month I have come near you, call me,” but, before calling me about the acceptance of prayers, you will have to fulfill the conditions, “Listen to me, act upon my directives.” This is the requirement; and have full belief and faith in all My powers. First thing Allah has stated is that people create such a condition of righteousness and regard for Allah that He hear them. If they have righteousness and have His fear then Allah hears their call. Secondly, “That they believe in Me.” What kind of belief? Belief on this matter that God exists and possesses all powers and abilities. If man has not experienced His existence and His having all powers and abilities and has not been bestowed the recognition of the existence of God and His being the possessor of all powers but if he has faith that there is God and He is the possessor of all powers, as though he has belief in the unseen, then from the side of Allah such understanding will be bestowed from which God’s existence, His being the possessor of all powers and the experience of His responding to prayers will be attained by him. First man has to strengthen his faith then Allah steps forwards and then the proof is also acquired. The Promised Messiah, may peace be upon him, has shed light in detail at various instances on the principles and philosophy of the conditions for the acceptance of prayers. At this point I will present some extracts from the Promised Messiah, may peace be upon him, from which, understanding the deepness of this subject, making this a way of attaining nearness to Allah, we can increase our knowledge and understanding, and be included among the ones who have acquired the true guidance, and be able to attain the true benefit of Ramaḍān. This is the principle of prayer that Allah does not follow our apprehensions and desires. Consider how dear children are to their mothers and they desire that their children do not suffer any kind of hurt. If children insist foolishly and crying ask for a sharp knife or a flaring spark of fire then would the mother, despite her true love and real affection, accept that her child take the spark of fire and burn its hand, or cut its hand by hitting it on the sharp knife? Never! From this, the principle of the acceptance of prayer can be understood. I myself have experience in this matter. When some part of a prayer is hurtful, that prayer is not accepted at all. This matter can be understood adequately that our knowledge is not certain and correct. We carry out many chores assuming them to be fortuitous and in our estimation think of their result to be blessed but at the end they cling to us as a sorrow and misery. That is, we cannot say that all human desires are valid. We cannot say for certain that they are valid because man is compounded of forgetfulness and error. To err is human nature. When there is something hurtful between what is desired and what will happen and Allah accepts it, this matter will be against His station of mercy. Thus, man think it should happen but the desire sometimes is harmful so if Allah accepts it then this matter will fall against the status of Allah at the station of Mercy. Allah desires mercy for the one who is praying, for his servant. If He fulfills every desire of his servant even if it is harmful for him then it is against his station of Mercy. This is a true and sure matter that Allah hears the prayers of his servant and bestows them with His acceptance but not worthless desires because man does not look at the end and result due to the pressure of desire and prays but Allah, who is the real well-wisher and observer of the outcomes, keeping in view the dangers and adverse results that can afflict the caller in case of the acceptance, rejects it. Man does not look at his end but Allah is the true benefactor of his servant and desires his welfare. He also knows the consequences. He is seeing the consequence and what is going to take place. He sees the dangers, the damages, the bad results, and keeping them before Him, rejects the prayer because Allah sees the welfare of man in rejection. This rejection of prayer is the acceptance of prayers of that person. When such a prayer is rejected by Allah and is not accepted, that is the acceptance of prayer by Allah because Allah determined that the matter was not good for the person, was not good for the servant. Therefore, such prayers in which man is safe from accidents and harms, Allah accepts them, but, harmful prayers are accepted in the form of rejection. Ones, which are beneficial, are accepted as they are and ones that carry harm for man are rejected and are not accepted and that is His acceptance. One that is benefitting and beneficial will be accepted. Every prayer will not be accepted. Thus Allah hears some prayers of His friends and prophets and not others. And does not accept them because He knows that they are not beneficial or their results can be horrendous. Allah has the knowledge of the unseen. He know better. It is true that a person who does not utilize action, does not pray. Only prayer is not necessary, actions also are necessary. If there are no actions and there is prayer alone then it is not prayer; you are trying God. Therefore, it is necessary to expend all your powers before praying. And these are the meaning of this prayer. It is necessary that man should look into his belief and actions because it is the way of God that reparation takes place in the context of means. For reparation certain means have to be at hand. He creates a means that leads to reparation. They should ponder at this point who say what is need of means in the presence of prayer. We have prayed so we do not need to arrange for means. They are ignorant. Ponder that prayer in itself is a covert means. Prayer is a hidden means for the accomplishment of an objective. It becomes a means for doing the task and sprouts other means. Prayer in itself is a means. With the acceptance of prayer, other means appear for the accomplishment of the desired matter. Someone needs a loan, needs funds, needs some help, Allah arranges that through some means. Makes it easy for him. Nothings trickles from heavens. If someone needs money, it will not descend from skies rather there will be some means. That is the means that Allah created through prayer. The placement of Iyyakana’budu (Thee alone do we worship) before Iyyakanasta’in (Thee alone do we implore for help), which is a prayer, is also explaining this matter. First said Iyyakana’budu then we seek Your help. We pray to You, ask for help from You. Attention is diverted towards means with prayer. We are seeing the way of Allah to be so that He creates means. Observe that He provides food for hunger and water for thirst but through means. The chain of means progresses so and the creation of means takes place. Because these are the two attributes of Allah, Wallahu Azizan Hakeema. Aziz is to be able to get everything done. He is Ghalib. He is powerful. He has power. He can do it and so He does. Hakeem means to carry out every matter adequately according to the circumstances and environment. Observe the diverse properties placed in matter and vegetation. Look at [Turbat]. It causes motions with an ounce or less. Same is [Sikmonia]. Allah is powerful to cause motions without means or to quench thirst without water but as it was necessary to introduce the wonders of nature. To the extent, the knowledge of the wonders of nature becomes vast; man knowing the attributes of Allah becomes capable of attaining nearness to Allah to the same extent. Allah has created these things. It is necessary for Allah to expend the knowledge of their properties. They are things created by Allah. As the knowledge of the things created by Allah increases, man’s awareness of the attributes of Allah also increases to the same extent. Their understanding is attained. Man becomes able to attain the understanding. This is the objective a person who bears faith. An atheist gives weight to his knowledge but a believer with increase in that knowledge becomes a knower of the attributes and power of Allah. Ponder, a child is in turmoil due to hunger. It becomes restless and cries for milk and screams. Milk is excited into the breast of the mother while the child does not even know the word for prayer. How it happens that child’s cries pull in milk? This is a matter that generally everyone has experienced. Sometimes it has been observed that mothers do not even feel milk in their breasts and many times it is not even there but as soon as the painful cry of the child reached the ear, immediately milk built up. As the cries of the child have a relation with the milk, I say truly that our cries before Allah if they have the same earnestness, they excites His mercy and benevolence and pulls them. To ask is man’s character. Acceptance is Allah’s trait. One who does not understand, does not accept, is a liar. The example of the child that I have related resolves the philosophy of prayer adequately. Rahmaniyyat and Rahimiyyat are not two. One who leaves one and wants the other, cannot attain. If we leave Rahmaniyyat to get Rahimiyyat, it cannot be. Rahmaniyyat has the benefit that it create in us the strength to benefit from Rahimiyyat. The Rahimiyyat of Allah, the power to get from Him by asking, Rahmaniyyat empowers it. One who does not do so is denier of favor of Allah. He is a denier of the favors of Allah. This is the meaning of Iyyakana’budu that we worship You only, with respect to the apparent means and efforts that have been given by You. We worship. We use apparent means. One means is prayer the other is to bring in action those means that for us have been designated for the task at hand. Ponder over the tongue that has been made of … muscles. Tongue has muscles made in it, there is saliva in it. We would not be able to speak it were not so. If tongue becomes dry, man cannot speak. If a muscle of the tongue is stretched, it just freezes there. Gave us such tongue for payer that can express the thoughts of the heart. Gave us tongue so that the thoughts of heart become apparent and man is able to speak. If we never take the chore of prayer from tongue then it is our misfortune. Numerous diseases are such that if they afflict the tongue, tongue instantly quits its function so much so that man becomes dumb. Thus, Rahimiyyat is this that we have been given tongue. Same way if a change takes place in the structure of ears, nothing would be heard. Same is the condition of heart. The condition of humility and fear and the powers of thought and pondering, if a disease takes over they all become dysfunctional. Look at the insane persons how their abilities becomes dysfunctional. Is it not incumbent upon us that we value these favors? If the abilities given to us by Allah through His utmost graciousness, leave unused without doubt we are deniers of favors. Then for sure we are the deniers of the favors of Allah, are ungrateful. Thus remember, if you pray leaving your abilities and powers dysfunctional then prayer cannot benefit at all. The abilities, the powers, the capabilities Allah has given and the directive to look at means bring all of them to use and then pray. Prayer does not benefit without them. When we did not bring into use the first favor then how can we make useful the other (favor)? The means Allah has created are also his favor. To bring them into use and then to pray is useful to us. The objective is this that examples of the acceptance of prayer are present in the laws of nature and Allah sends living examples in every age. For this reason, He has taught the prayer of Ihdinas-Siratal-Mustaqim Siratalladhina An’amta ‘Alaihim, This is Allah’s desire and law and no one can change it. It is expressed in the prayer of Ihdinas-Siratal-Mustaqim, that perfect and complete our actions. That perfect out actions and take them to their possible perfection. Pondering over these words brings out that apparently there is a directive to pray. Apparently there is a clear pointer to pray. It is taught to ask for guidance of Siratul-Mastaqim. Ask for guidance of Siratul-Mastaqim from Allah, pointer is to it. But Iyyakana’budu and Iyyakanasta’in before it is directing to take advantage of it. That is, to tread various levels of Siratul-Mastaqim, one should ask for Allah’s help while using pertinent capabilities. The powers Allah has given to tread on the straight path use them and ask for Allah’s help. Thus it is necessary to use apparent means. One who abandons then is denier of favors. There are many diseases – the example of tongue has been given previously – that if they afflict the tongue, it instantly stops functioning. This is Rahimiyyat. In the same way he put the condition of humbleness and fear in the heart and bestowed the powers of thinking and pondering. Thus remember that if we pray leaving these powers and abilities unused, such prayer will not be useful or effective because as the first favor is not used what benefit will we draw from the second. That is why Iyyakana’budu before Ihdinas-Siratal-Mustaqim is saying that we did not abandon and disuse Your previous favors. Remember that is the character of Rahmaniyyat that it empowers to take advantage of Rahimiyyat. That is why when Allah said Ud’uni Astajiblakum, it is not just words rather human status requires it, asking is human trait and one who is not a seeker of acceptance from Allah – is not searching for acceptance of prayer by Allah – is a transgressor. Prayer provides such condition of pleasure, I am in sorrow that in what words may I make the world understand this pleasure. This can only be recognized through feeling it. In short, among the requirements of prayers it is important first that create righteous actions and faith. Good actions are actions Allah has direct to carry out. And strengthen your belief and faith because the person who does not straighten out his beliefs, and does not bring into use righteous actions and prays, he though tries Allah. Matter is this that the purpose of the prayer of Ihdinas-Siratal-Mustaqim is to seek perfection of our actions, and then by saying Siratalladhina An’amta Alaihim, matter is made clearer that we seek the guidance to the path that is the path of the favored. (That is, show us the path of such people who have been favored by You,) and save us from the path of the Maghdub. (Save us from treading on the path of those who were afflicted with your wrath.) May our action be always correct. May there be nothing that is counter to the directives of Allah. Those on whom the punishment of Allah descended, and by saying Dallin, taught this prayer, that save us from this too that we wander without your guidance. Save us from this matter too that we do not have your support. That we do not take advantage of your Rahmaniyyat and as a result are not able to take advantage of Rahimiyyat as well. That we do not become devoid of assistance, help, mercy and graciousness, and wander. By saying Dallin, diverted attention to this side too. The matter is that there no pain otherwise physician does exist. What kind of a lover is the one that the beloved never pays attention to! Physician is there but there is no pain. There is no pain in you. Physician is there. Create pain in yourself. Allah does hear. Allah desires that you come to him with a pure heart. Only requirement is that make yourself comply to His condition and act on Falyastajeebulee and create in yourself that true change which makes you able to go in the presence of Allah. Thus create such love with Allah that He be the hearer of prayers. If there is true love then he hears most prayers and shows support. This is the requirement that there is love and sincerity towards Allah. Love of God is such a thing that burns the lower life of man and makes him a new and clean human. Purifies him. At this point he sees what he did not see before and hears what he did not hear before. Whatever provision of graciousness and honor Allah has prepared for man, He also has given the capabilities to attain it and to benefit from it. Not only just made the things but also provided capabilities to use them and to take advantage of them. If He had just provided the capabilities but had not provided means then there would have been a shortcoming. And if there were means but not capabilities, what was the benefit then? But that is not the case. He provided capability and also provided means. As, on the one hand, he created the means for bread, on the other hand, put at work eye, tongue teeth and stomach and liver and made of all this mechanism dependent on food. Liver, stomach, intestines, all are necessary to digest food. Clarified food will become part of the blood and how the rest will it be made? In the same way, before all else, He has done this favor that He sent the Holy Prophet, may peace and blessings of Allah be upon him, with a perfect religion like Islam. and made him Khatamun-Nabiyyin and bestowed a perfect and the best of book like the Holy Qur’ān, after which no other book will come to the end of times and neither a new prophet will come with a new law. Then if we do not use the capabilities of thought and pondering and do not take a step towards God, how much laziness, idleness and ungratefulness that is! Ponder that in this very first chapter how Allah put forwards for us ways to gain His favors. This is the way to benefit. Gave us a prophet like the Holy Prophet, may peace and blessings of Allah be upon him, to follow his example. Gave us book like that of the Holy Qur’ān that we act upon its directives. In this very first chapter, Surah Faitihah, how He showed us the path of graciousness. In the Surah, whose name is Khatamul-Kitab (best of the book) and Ummul-Kitab (mother of the book) also, has clearly explained what the purpose is of the human life and what is the way to attain it. Iyyakana’budu though is the real purpose and objective of human life. And putting Iyyakanasta’een before it, it has been told that it is necessary that as far as man’s own power, stamina and understanding concerns, make a concerted effort to tread upon the ways of the pleasure of God and put to use fully the powers given by Allah, and after that pray for their fulfillment and that they produce results. This is true that Khuliqal-Insanu Da’eefa, man is created weak. He cannot accomplish anything without the graciousness and mercy of Allah. Without grace, man cannot do anything. The means of his existence, progress and continuance are also based on the grace of Allah. Foolish is that person who is proud of his wisdom or knowledge and wealth and affluence because all these are given by Allah. Where did they bring them from? For prayer it is necessary that man recognize and realize his weakness and fragility. As he ponders over his weakness, he will find himself deserving of Allah’s help. As a result an excitement will be created in him towards prayer. When a person is in trouble and feels pain of constraint, he calls or cries with full strength and asks others for help. In the same way if he will ponder over his weaknesses and infirmities, and will find himself deserving of the help of Allah, his soul will become restless with full excitement and pain and will fall on the threshold of God and will wail, and will call out O Lord, O Lord. Look at the Holy Qur’ān closely, and you will find that in the very first chapter Allah taught about prayer, Ihdinas-Siratal-Mustaqim Siratalladhina An’amta Alaihim Ghairil-Maghdubi Alaihim Wa Lad-Dallin. Prayer can be comprehensive only when it has benefit and beneficence in it, and saves from all harms and hurts. That prayer is befitting that carries whatever benefit man can attain, whatever is better, and saves him from harms and hurts which can afflict him. Thus in this prayer (from Ihdinas-Siratal-Mustaqim to Wa Lad-Dallin) are desired all best benefit that can be attained and is possible. This is the prayer for saving oneself from harmful matters which annihilate man. Thus this matter should always be kept in mind that the greatest prayers that have been offered in here, they are not prayers for world, they are prayers related to faith. We should give most preference to the prayers for saving our faith. When a person pursues so then the door of the nearness to Allah opens and then rest of the prayers are accepted all by themselves. Ujeebu Da’watad-Da’i Idha Da’an, that I accept the repentance of one who repents. This promise from Allah sanctifies that pronouncement done by a repentant with true heart. If there was no such pronouncement from Allah then the acceptance of repentance was a difficult matter. A pronouncement which is made with true heart, its result is that then Allah also fulfills all His promises that He has made with the repentant and from that very moment a burst of light starts in the heart when man makes this promise that he will save himself from all sins and will give preference to faith over world. The real purpose and essence of Salat is prayer. Praying conforms with the law of nature. As an example, generally we see that as a child cries and wails and shows restlessness, how mother rushes to gives it milk. There is a same kind of relationship amongst divinity and worship which cannot be understood by every person. When a person falls on the door of Allah, and presents his matter with much humbleness and apprehension, and asks for his needs then the mercy of divinity is excited and mercy is shown to such person. The milk of the benevolence and mercy of God also requires a crying. If you want to drink the milk of the favor and mercy of God, if you want to benefit from His favor and mercy, you will have to use humbleness, meekness, crying and wailing for that. Therefore, in His presence a crying eye should be presented. Thus in Ramdan, as the attention of most is towards mosque too, with the grace of Allah, and attention also is towards offering prayers in congregation, attention should also be paid towards offering Voluntary Prayers, and then the prayers which are for giving preference to faith over world and to attain the nearness of God, they should be offered in preference. These should be the first prayers, other prayers should come after. Then Allah takes care of our worldly needs Himself. O Lord of the worlds, I cannot thank for your favors. You are very Merciful and Bountiful. Your favors upon me are unlimited. Forgive my sins so that I do not perish. Instill your pure love in my heart so that I attain life. And, cover me. And, have me accomplish such actions that make You pleased. I, with your Bountiful Face, seek your protection that Your wrath afflict me. Have mercy and save me from the trials of this and the next world as all favor and mercy is in your hands. Amen, Amen again. May Allah do so that we are the ones who understand the reality of prayers. May this Ramaḍān make part of those, and then keep us on it permanently, who are strong in their faith in God, hear His directives and act upon them, and give preference to the pleasure of Allah in every matter. May our actions comply with the pleasure of Allah, and our faith be strengthened more than ever. May true love of Allah generate in us. May Allah save us from the trials of this and the next world. I will lead two funerals in absentia after Salat. One is of Raja Ghalib Ahmad who was a seasoned servant of the Aḥmadiyya Community and a renown Urdu poet and writer. He was educationist. He was government servant. He was chairman of Punjab Textbook Board. He passed away in Lahore on 4 June 2016 at the age of 88. Inn lillahi Wa Inna Ilaihi Raji’un. He was born in Gujrat in 1928. His father, Ḥaḍrat Raja Ali Muhammad, was a companion of the Promised Messiah, may peace be upon him, who pledged allegiance in 1905 and joined Ahmadiyya Community. His father attained the opportunity to serve as Nazir Mal and Nazir A’la. Malik Barkat Ali was his maternal grandfather. Ḥaḍrat Malik Abdur-Rahman Khadim, Khalid-i-Ahmadiyyat, was his maternal uncle. He matriculated from Lahore. He completed his FA from Qadian and obtained masters in Psychology from Government College Lahore and stood first. He was was recognized with respect and honor in country’s educational and literary circles as a poet, thinker, educationist and literary critic. In Al-Fazl and the magazines of the country, his poems and writings were published in Urdu and English. He started his service from Pakistan Air Force. In 1962, he joined Education Department Pakistan. He held important distinct offices. General secretary and controller Board of Higher Secondary Education Punjab, Chairman Board of Intermediate Sargodha, Chairman Punjab Textbook Board, Advisor Education Government of the Punjab are his distinguished national services. There is a long list of service to Ahmadiyya Community. Jamā’at District Lahore General Secretary, Secretary Ta’lim and numerous offices. After 1976, spokesperson Jama’at Ahmadiyya, represented in press conferences and issued press releases, wrote letters to newspapers and issued statements. 1992-97 Director Fazl-i-Umar Foundation, 74-85 Director Waqf Jadid, and was also Na’ib Sadr Nasir Foundation. He was simple and mild. Had strong relation with Khilafat. Had great respect and honor for Jama’at officials. May Allah show his mercy towards him. Elevate his status. He did not have any children. They had an adopted daughter. May Allah give her patience and perseverance. Second funeral is that of Respected Malik Muhammad Ahmad who had devoted his life to the service of Ahmadiyyat expired on 6 May 2016. Both these were to be offered last time but were missed due to some reason. Inna lillahi Wa Inna Ilaihi Raji’un. He was the eldest son of Ḥaḍrat Shaikh Fazal Ahmad Batalwi, may Allah be pleased with him, companion of the Promised Messiah, may peace be upon him. He had strong relationship of love and fidelity with the Organization and Khilāfat. He advised all children to adopt the same attributes. He was obedient, gentleman, friendly, extending favors to relations, benevolent and pious person. Throughout life supported many families. Discharged the responsibility of the education of some children, and took care of the responsibility until last breath. He was one of the 5,000 Mujahidin of the Tahrik Jadid Dafter I. He took part with open heart in building mosques and other campaigns. Gave a plot of land in Rabwah to Jama’at. He devoted his life on 20 October 1945 to the service of Ahmadiyya Islam. First he was working outside Rabwah and then he moved there and served in the building department for Rabwah during 1949-55. During 55-68 worked in Wakalat Tabshir as superintendent, served 69-82 as Na’ib Afsar Amanat, 82-86 as Naib Wakil-Mal Thani. Retired in 1985. He was reemployed and continued serving until June 89 and served 86-89 as Na’ib Wakilut-Tanfidh. He served for about 47 years. Then he came to Germany to his children, spent his time in worship, reading Qur’ān and books of the Promised Messiah, may peace be upon him. He was Musi by the grace of Allah. He left 2 sons and 4 daughters. Laiq Tahir, our missionary, is his younger brother and is Waqif Zindagi here. His younger son Mahmud is in Al-Fazl International. May Allah treat him with forgiveness and mercy, and may allow his progeny to have a sincere and affectionate relation with Khilafat and Jamā’at.